The plan is there is no plan. At least until after qualifying. 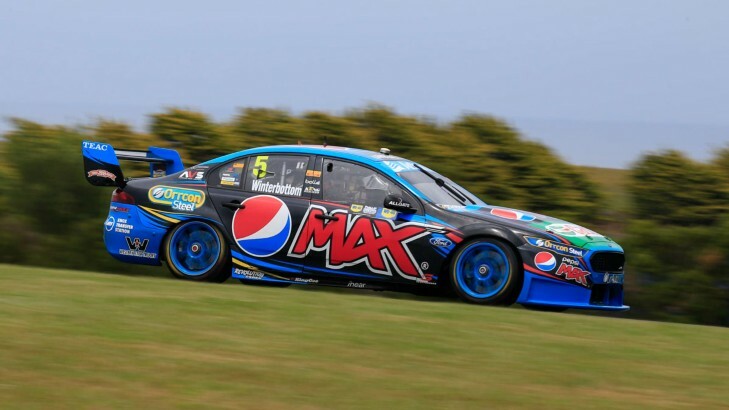 That's V8 Supercars championship leader Mark Winterbottom's philosophy after being amongst the fastest drivers during a wet practice day at the WD-40 Phillip Island SuperSprint. Winterbottom leads the title chase by 239 points over Prodrive Racing Australia team-mate David Reynolds, with Red Bull Racing Australia's Craig Lowndes the only other realistic title shot another point further back. A maximum 600 points are available at Philip Island and the championship finale, the Coates Hire Sydney 500. Winterbottom would win his and Prodrive's first championship with a round to spare if he leaves the island with a 301 point advantage. Winterbottom was fourth fastest in the drier opening session in his Pepsi-Max Ford Falcon FG X and topped times later in the second one-hour session. But he was seconds away from his own 1 min 30.6099 sec qualifying lap record. Winterbottom said he wouldn't know until after Saturday's two 10-minute back-to-back qualifying sessions just how he would approach the two 60km sprints. The same applied on Sunday when a single 20-minute qualifying session determines grid order for the 200km mini-marathon. "You have to qualify that is the key thing. If you have a quick car you qualify well up the front and get a good start and you are away from that pack," Winterbottom said. Winterbottom made the point that a mistake in Sunday qualifying at the ITM 500 Auckland had left him mid-pack on the grid and was then spun to last early in the race. He fought back to finish 11th but dropped significant points to both Reynolds and Lowndes. "When you are in the pack you are vulnerable. But when you are up the front you can control your own thing. When you are in the pack you have got to race. "It's just one of those things. You can't just say you are going to do this or that, you have to see where you end up after qually. "With back-to-back sessions you could be up the front in one and down the back in the other if something goes wrong. "So you just have to evaluate it when the job's done." Winterbottom expressed some frustration at media pundits suggesting he could just "putt around" to clinch his title, or that he was "tightening up" at the business end of the championship. "You are always driving as hard as you can ... it is bizarre how some people read the play or write about it sometimes." Promisingly, Winterbottom said the team had been able to make significant set-up progress on his Falcon today. In New Zealand he had complained that the absence of injured team-mate Chaz Mostert had slowed car development. "We made a change between sessions. We had been chasing a direction on the car for a long time and that was the first real big progression forward we have made, so I am pretty happy even though the day was mixed to get that change in and get a good read. The data looks good as well. "We were just trying things," he added. "You don't want to go too far away from what you have got, but today it was nice. "In the first session it was okay and in the second session in areas we were chasing it was actually pretty good." Winterbottom said the challenge now would be to try and maintain these new gains while also improving existing strengths. He was confident the tuning progress would translate to the dry. "It should. We should be okay. We will find out I guess. It felt good, which was nice."